Being outdoors is healthy for kids of all ages and offers all kinds of benefits. Everyone needs to get sun to produce healthy amounts of vitamin D and exercise is essential in development and health. 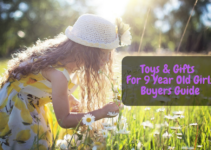 Depending on the age of your child though different things are being developed and the best outdoor playsets for kids that you choose, should try to reflect that. At this age children are still developing much of their hand-eye coordination and balance skills. 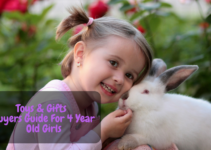 They are also beginning to understand the world around them more and will be more inquisitive and willing to try out new activities and toys. To help facilitate the process of learning coordination and balance toys that involve pushing and pulling or ride in toys are excellent such as the Step 2 Roller Coaster. At this age, children become capable of immense amounts of understanding and learning as well as being very imaginative in their play. It is at this age children will become very fond of visualizing themselves in a certain role such as a pilot or police officer, and outdoor playsets for kids with things like captain’s wheels and periscopes become a very enticing place to play pretend. This stage of development is when children mostly begin to take a genuine interest in athletic activities and become increasingly competitive with their peers. For this age group, the best outdoor playsets for kids are things like the geometric dome. These are great as they help develop athletic skills and can even be used for creative and competetive games. 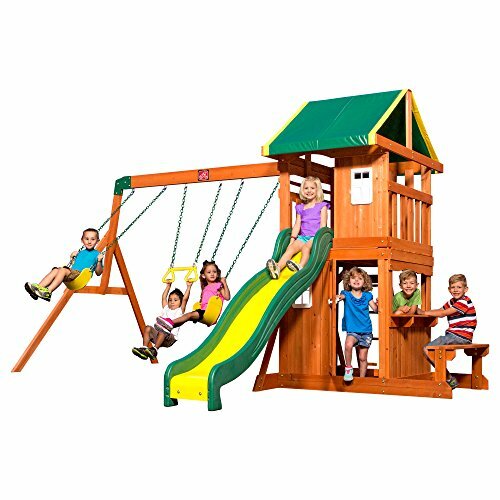 The first outdoor playset on our list is the Step2 Clubhouse Climber. 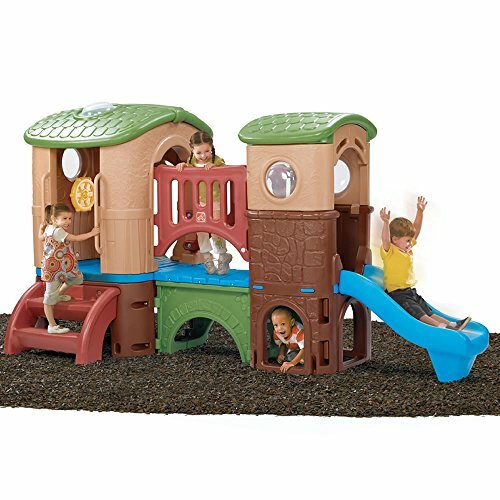 This playset is constructed of durable plastic and is easy to assemble. It comes in two boxes that contain the large plastic parts that snap together easily with clear simple to follow instructions included. Once assembled the playset is ready to go and requires no fastening to the ground as it’s heavy and stout enough to stay firmly planted on its own. The fully assembled structure is about 4 feet wide by 8 feet long and 6 feet tall, making it a little on the small side when compared to many of the other playsets on this list, but it’s great for younger children. 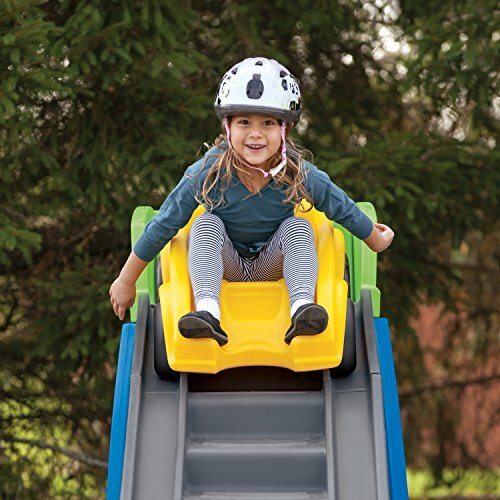 The design features non-slip stairs and easy-grip handles to allow safe access to the main part of the playset which includes skylights and a captains wheel for imaginative play. There is also a bridge which connects the main portion to a watchtower on the side that has a slide, as well as a hideout area underneath the playset. 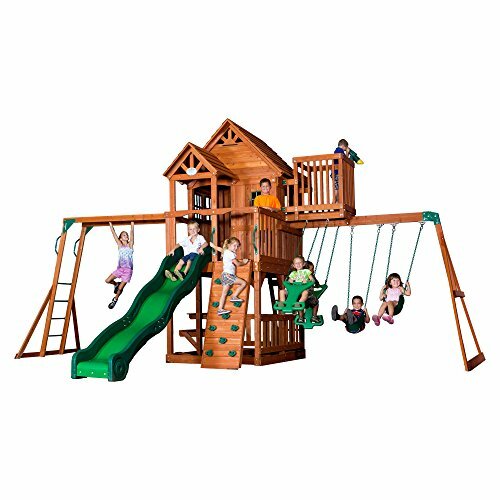 The Backyard Discovery Silver Springs playset is a high-quality playset made from all cedar wood that comes prestained and is specifically selected for having fewer knots, making the wood more durable and able to withstand any season without cracking or rotting. Once constructed the playset measures around 12 feet in width, just over 14 feet long, and almost 9 feet tall. On one side of the playhouse portion of the set is a 2 belt swing beam that can support 150 pounds per swing and comes with one set of trapeze bars. On the other side is a small bench with a snack window that lies on the lower portion of the playhouse. A ladder on one side leads up to the clubhouse portion of the set above the snack window and gives access to the 8-foot wavy slide. Difficult construction requires power tool and drilling into wood. Some skill required. 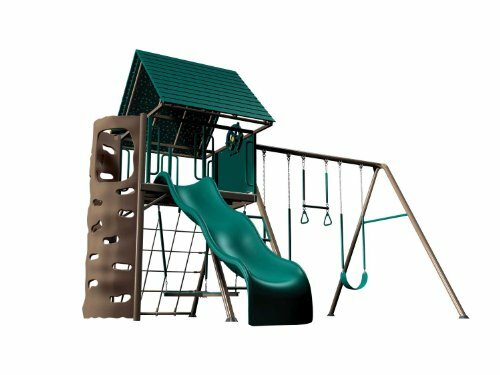 The Big Stuff adventure playset is a large metal playset that features a wide variety of athletic and fun stations for children of almost any age to play on. On one side there is an arm that supports two swings and a trapeze bar that swings from side to side and has two handles and a straight bar for holding onto. On the opposite side there is a climbing wall that is similar to a rock wall but instead of having rocks protruding out it has rock shaped holes for easier and safer gripping. There is also a ladder or a rope cargo net for climbing up to the clubhouse portion of the playset which has a 9-foot wavy slide for getting back down. The clubhouse also boasts a captain’s wheel and a mounted set of binoculars. Once constructed the playset is roughly 14 feet by 16 feet. The Skyward Summit from Step 2 is an interesting 5-foot by 7-foot mountain of cargo nets and rocks that children can climb and explore. Unlike ordinary playsets that aim to invoke a clubhouse feeling this set goes for a more adventurous mountain setting. 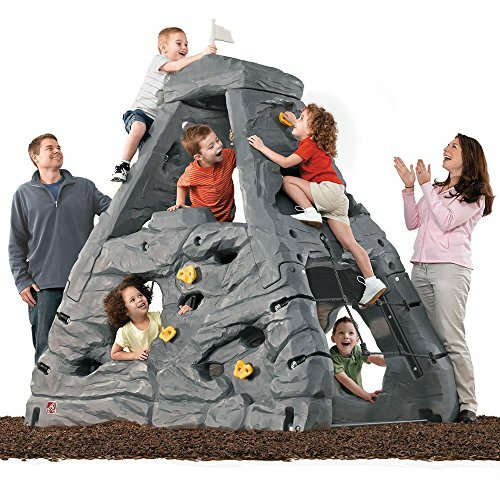 It forgoes things like swings and slides in favor of four unique climbing surfaces the present a variety of climbing challenges to children of many ages. The design features two cargo nets for climbing as well as 9 rock shaped grips and a number of holes for grabbing as well. There is a platform roughly halfway up the structure’s 7-foot height that allows smaller children to take a break from their climbing and take in the views from a new perspective. The set also comes with a flag that can be planted on top of the summit to allow for fun games such as capture the flag. The Skyfort 2 is a massive playset that comes in four separate boxes and once assembled is an impressive 22 feet wide by almost 17 feet long and just over 12 feet tall. 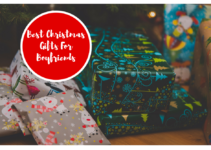 Like the other Backyard Discovery sets on this list, it is made from an all cedar construction that comes pre-stained and is checked for knots before being selected for use in a playset to ensure durability. The set features monkey bars on one end and a three position swing beam on the other. There is a rock wall as well as a ladder to allow for access to the elevated clubhouse that features a cool lookout as well as a door and several windows with a 10-foot slide for coming back down. For more relaxed and less athletic play Step 2 has the All-Around Playtime Patio that is a 4-foot by 4-foot covered cooking playset. On one side the set has a sand and water play area that features plenty of activities for children to play with sand or use the water tower with a spinning water wheel. On the second side of the set is a grill area where children can use the included food articles to cook up their favorite foods outdoors. Finally, the third side of the set is a snack table area that comes complete with cupholders. The set includes a cover for the sand and water tables and allows for easy storage of the food and cooking toys when not in use. The fourth side of the set is a swinging door entrance to get under the shaded canopy area. 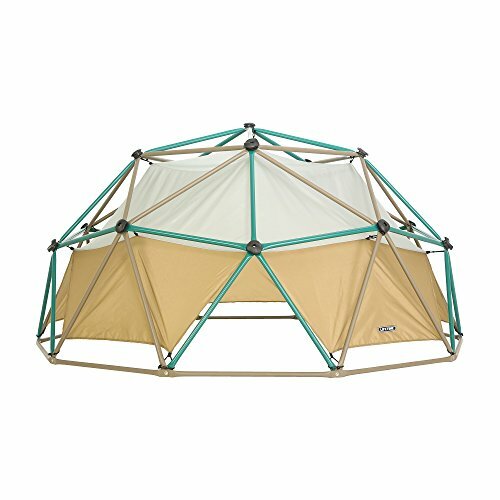 The Lifetime Products geometric dome is something you’ve probably seen on school play yards and in parks before. It features a tough steel construction and is the perfect place for children ages 3 to 10 to climb around and have fun with friends. The structure can support up to 600 pounds in total weight and is simple to assemble but requires a bit of time. This particular dome can be climbed by grasping the bars themselves or by grabbing onto the plastic rock climbing style grips that are used at the junctions between bars. The dome has a 10-foot diameter and is 5 feet high at the center. It’s available in two color options either earth tone or primary colors and can also be purchased with a canvas that can transform the dome into a cozy tent. 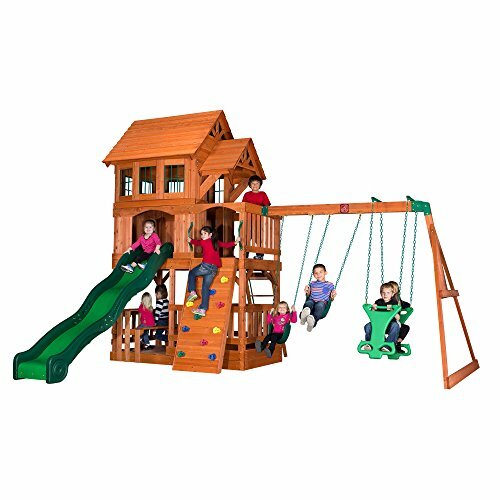 For those who want a high-quality all cedar play set but don’t necessarily have all the room in the yard to put one up Backyard Discovery offers the Liberty 2. 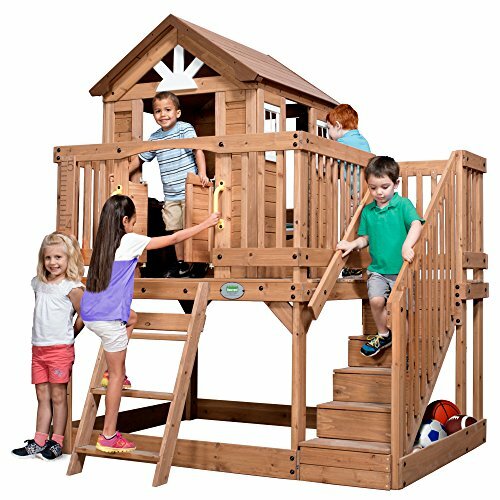 This playset features the same all prestained cedar construction that the company is known for, but is shrunk down to only be 16-feet wide and about 14-feet long. The swing beam can still support up to three swings and comes with two belt swings and a two-person glider swing. What the Liberty 2 gives up in the size of its footprint it makes up for in height as the clubhouse stands over 12-feet tall and features a rack wall and ladder for entry as well as a lookout and a 10-foot slide. Difficult assembly requires power tools. Skill required. For those looking for something simpler geared towards children age 2 to 5 the Step 2 Extreme Roller Coaster offers an excellent option. The set is easy to assemble, is lightweight by comparison to more full-featured playsets, and takes up minimal space. The extreme coaster is designed with stairs that go up the ride with rails on either side that the accompanying car slides down. The platform is 30-inches off the ground and the track for the slide is 9 feet in length. The process of pushing the car up the track and then getting in it to ride down develops strong balance and motor skills in young children in the age range this set was intended for. The set itself weighs 34 pounds all together and supports a maximum weight of 75-pounds. 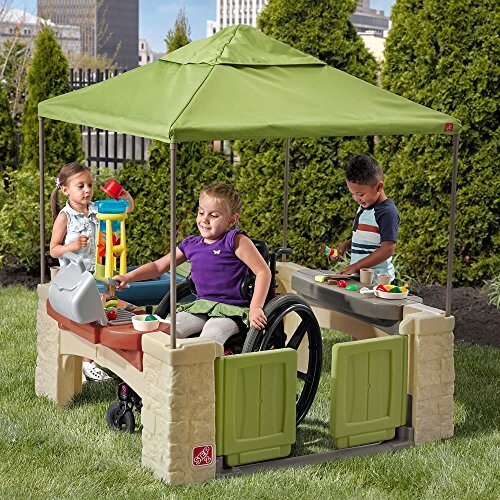 If your child doesn’t take a liking to swings, monkey bars, or slides, but prefers a comfortable place outdoors to play and relax then the Backyard discovery Scenic Heights playset is an excellent choice. Even more compact than the Liberty 2 design this playset only takes up less than 7-feet by 7-feet and comes in only two boxes. As with all Backyard Discovery sets this one is made of cedar wood and requires some substantial construction. The clubhouse features an elevated deck three feet off the ground with some steep stairs allowing access. Inside there is a play kitchen as well as plenty of open windows and swinging doors. The clubhouse also has a comfortable padded bench that has pull out storage chests underneath it which offer a great space to store outdoor toys such as balls and rackets. Difficult construction, some skill required.